For many people living on a budget, take away is a rare treat. One meal for a family of 4 can cost anywhere between $25-$40, taking out fair chunk of income. But occasionally large chain restaurants will offer a free meal or drink and this is a great time to take advantage of this offer. On Saturday August the 23rd, KFC Australia are opening their kitchens for a free half hour tour to see first hand how their chicken is prepared. 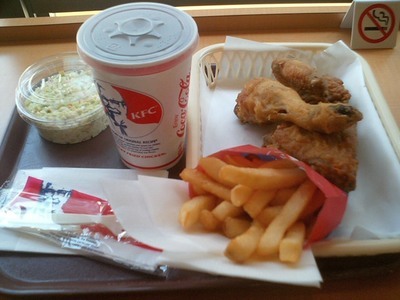 At the end of the tour you will receive a free meal of 2 pieces of chicken, chips and a drink. How good is that? There are only a few stores involved in this promotion so you will need to book in fast. Too book and find out if a location near you on this website. you don't see free meals very often!